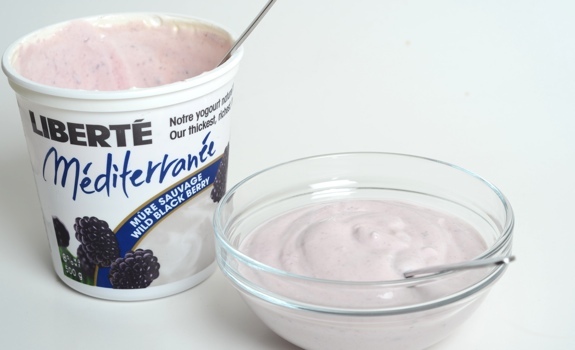 Liberté Mediterranée wild blackberry yogurt -- both delicious and health-minded. Somewhere along the way, yogurt went from delicious, nutritious food to processed pseudo-food, a scientific experiment that spiralled out of control. See, bad things happen when you start counting calories obsessively. When faced with two yogurts on a dairy-case shelf, one that’s 250 calories per serving and another that’s 100, health-minded label-readers often pick the lower-cal variety. This trend started a long time ago, and it’s eventually evolved into a nutritional-claim circus. Similarly, sugar has been replaced by glucose-fructose, which has been replaced by glucose-fructose supplemented by artificial sweeteners, which has finally been replaced by nothing but artificial sweeteners. Yeesh. What the hell is left in a yogurt after it’s been cut down to a measly 35 calories per serving? Not goddamned much. So, the curious lesson here is that while health nuts helped bring yogurt to the masses, a whole different faction of misguided health nuts is ruining the party. Something must be done. A stand must be taken. This is why I’m so happy to see a few dairy companies still producing real, old-fashioned fruit-flavoured yogurts. They’re fatty, they’re sweetened with real sugar, and they’re proud of it. The Mediterranee line from Liberte is a godsend, and their wild blackberry flavour is amazing. The Pitch: “Our thickest, richest, fruit bottom natural yogurt.” That’s right. The fruit flavouring is on the bottom, so you have to stir it all by yourself before serving, just like in the old days. Good stuff. One very small victory for the slow food movement. The Seeds: Yes, there are seeds. 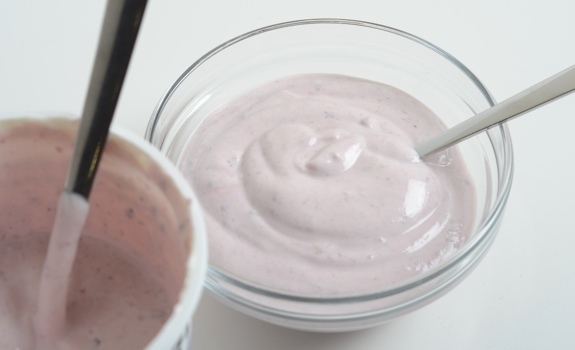 This is a natural-style yogurt, and blackberries have seeds. Deal with it. The Taste: 8% milk fat, eh? Yep. You can taste it. It’s thick and creamy, rich and sweet without any artificial sugar substitutes or candy-like artificial flavours. It’s the real deal. The cream slides across your tongue and down your throat, filling your mouth with dairy goodness. The fruit is still in little flecks of ground-up berry, lending it a jammy intensity that tastes just right. There are seeds in this here yogurt! Which is good, considering real blackberries have plenty of seeds. Cost: $4.45 for a 500 mL tub at a local grocery store. Value for cash money: Not great, compared to other yogurts. But this isn’t like other yogurts. Availability: In Edmonton, fairly widespread. Check natural-food stores and large supermarkets. Nutrition? : Per 175 grams: 250 calories, 14 grams of fat, 6 grams of protein, 20% each daily value of calcium and vitamin A.
Vegetarian friendly? : Yes! There’s no gelatin, which is a common concern in modern yogurts. The verdict: This is a fabulous yogurt. It’s a bit expensive to be a regular daily habit, and the calorie count is admittedly a tad high, but I could see myself picking up a tub every week or two. Add a few fresh, ripe blackberries, and the experience will be complete. Gee this sounds like an ideal yogurt for making a sauce with either that Cannery Blackberry Porter or possibly Fernie Brewing Co.’s What The Huck(huckleberry wheat ale). Hmm, both of them with pork…I’m thinking 1/3 yogurt, 1/3 soup broth or stock & 1/3 beer. Just need to work out seasoning specifics…*scratches head*hmm. I’m more of a baker than a cook, so the culinary use that leaped into my mind was subbing this in for vanilla yogurt in my blackberry white chocolate scone recipe. Decadent! Oh that’d be great! And ys decadent…but, hey we all deserve a few little treats – speaking of which, did you see my beer postings? And the recipes listed on/at http://www.beercook.com/ ? Scroll down, there’s what looks like a great Raspberry Ale Chicken recipe, not to mention a Bavarian Weiss Chocolate Cake recipe …hmm, IPA Beer Donuts(? ), Maple Ale Apple Fritters…gotta stop, I’m drooling on my kjeyboard! I came across your blog after googling reviews for vegetarian buffalo chicken wings. Sadly I googled after having eaten one… Anyway, I then noticed lots of the products you were reviewing, I’d seen in stores. I assumed you were in the US, but I see you are in Edmonton, so that explains it. Just wanted to say I appreciate your reviews! Oh and this yogurt is available at Costco in single serving size and 0%MF, still oh so creamy though and they still use SUGAR! YUM. Thanks! I’ll try to track down some of the 0% yogurt you mentioned. I don’t get to Costco often, but I think I’ve seen a fair number of other Liberte flavours at Planet Organic. It’s getting harder and harder to find yogurt that hasn’t been spiked with artificial sweeteners. Some of those are OK, but others taste like the inside of a rusty tin can. Ick.